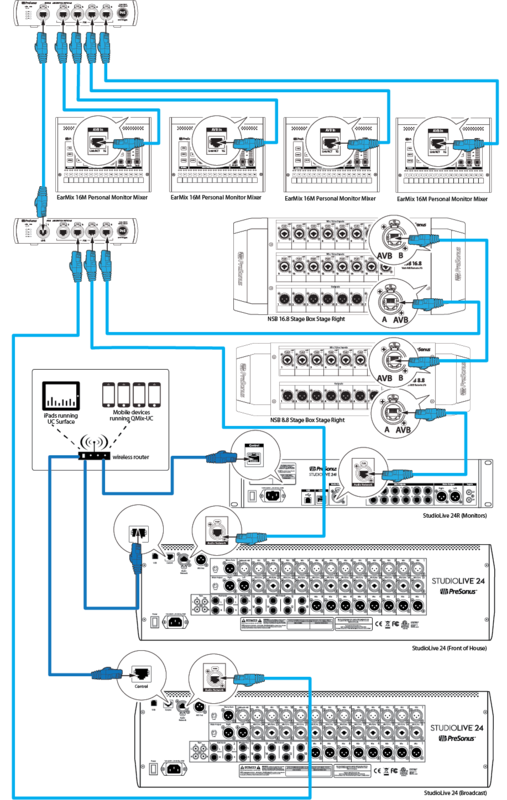 Within the PreSonus AVB ecosystem, a StudioLive Series III mixer must be used the master word clock for the network. For some devices, clocking is handled automatically. For others, additional set-up is required. This article will provide an overview of the steps required for proper system clocking. Because the EarMix 16M is a listener only, it defaults to clocking from the incoming audio streams.As soon as you route an AVB Send to your EarMix 16M, it will sync to the master mixer. NSB-Series stage boxes are designed to provide both remote inputs and remote outputs for StudioLive Series III mixers. Like the EarMix 16M, the NSB-series stage boxes will default to external clock and sync to a StudioLive Series III mixer as soon as AVB sends are routed to their outputs. It is important to note that these AVB sends must be routed whether they are needed or not. 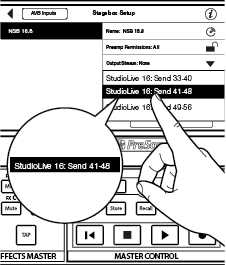 Let’s look at the common example of a StudioLive 16 console mixer with two NSB 8.8 stage boxes. In some situations, the eight outputs on the second NSB 8.8 stage box may not be needed to pass audio. In this case, routing an AVB output stream from the mixer to the stage box would still be required for proper clocking. StudioLive Series III mixers provide a customized mode when used as Monitor mixer. This mode allows them to retain independent control over their FlexMix outputs while sharing input streams as well as the Main Mix with the Front-of-House mixer. 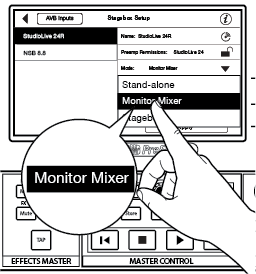 As soon as Monitor Mixer Mode is engaged on a StudioLive Series III mixer, its clock is set to sync to the Front-of-House console as well. No further set-up is required. StudioLive Series III rack mixers also provide a customized mode to function as a stage box for other StudioLive mixers. This mode allows them to share all their inputs and outputs with the Front-of-House mixer, effectively disabling all DSP functionality. 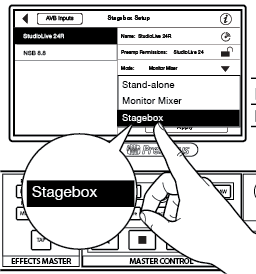 As soon as Stagebox Mode is engaged on a StudioLive Series III rack mixer, its clock is set to sync to the Front-of-House console as well. No further set-up is required. 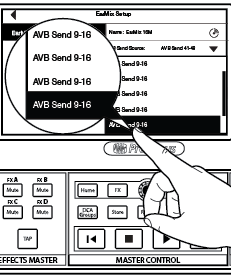 In applications where two or more mixers are on a network, functioning independently, but configured to send and received streams to and from other AVB nodes on the network, you must designate one mixer as the clock master. 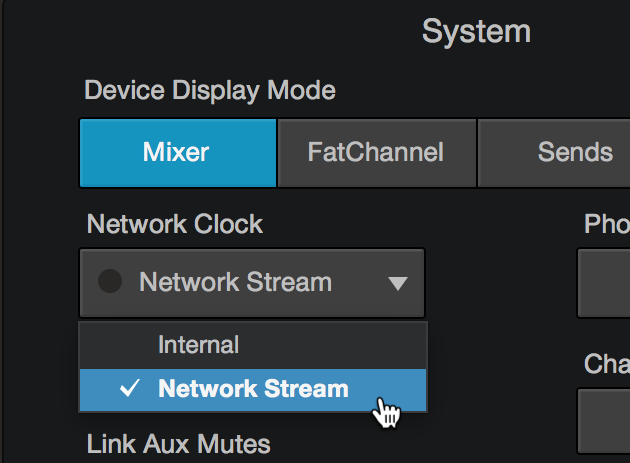 To do this, simply set all other mixers to receive clock from the Network Stream and be sure a stream is routed to the first AVB stream of each mixer from the master mixer. Be sure to leave one mixer on its Internal clock. On a StudioLive Series III console mixer, configuring external clocking can be done from the System Menu located on the Home Screen. 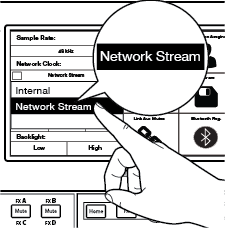 On all StudioLive Series III mixers (rack or console), configuring external clocking can be done from the Device Settings Menu in UC Surface.